We all want to save wherever we can, and the pantry is a place where small steps can make a considerable difference. Learn how to cut back and cash in with these nine pantry tricks that will save you big. Raised or stacked storage (like bleachers in a gymnasium) will let you see more of your canned and jarred items simultaneously, so you instantly know what you have at your disposal. Often, these storage devices are expandable — like this three-tier spice organizer — to accommodate spaces of varying widths. If you have a lot of mouths to feed, or you consume large quantities of a particular food item, you'll save money by buying in bulk. When you get home, you can divvy up the portions into your own containers without paying the extra "convenience" costs that are passed on to you for pre-packaged items. This practice also helps you reduce runs to the store to refill, which, in turn, saves you time and gas money. By putting goods like cereal and pasta in airtight, see-through containers, you're helping yourself out two-fold. One, you'll be able to see right away what you need more of, and what you don't (therefore reducing your grocery bill). Two, the food will stay fresher longer than if left to sit in rolled-up bags in the original boxes. Don't know what the FIFO method of storing is? Simple — first in, first out. In other words, you should be removing/consuming pantry items in the order you put them in, instead of eating newer items first. That way, you don't waste food by letting items expire. Instead of filling your pantry with a hodge-podge of things you'll "probably" eat, focus on things you know you'll eat — like healthy, all-meal ingredients that are part of your everyday diet. "Keep healthy staples, such as oatmeal, brown rice/whole grains, and dry beans — stored in airtight BPA- free containers to ensure they last longer — as well as canned tomato sauce, diced tomatoes, and low sodium bouillon or broth as recipe starters," advises registered dietitian Kristie LeBeau. "You can cook large batches of beans, soups, grains, and oatmeal for a quick, low-cost, healthy meal." If you're a snacker, you'll save a bundle if you scour the aisles after a big snacking holiday like Halloween, Christmas, or Easter. Most popular snack brands release goods in holiday packaging, which is drastically reduced — sometimes to the tune of 75% — just days after the holiday. These items have just as long a shelf life as the regular packaged items but at a fraction of the cost. Don't go overboard, of course, but a few bags of discounted chips, cookies, and crackers is never a bad idea. One of my worst habits when I was younger was going to the supermarket blind. By that I mean I would shop for pantry items that I wasn't sure I had or not, because I didn't check before I left the house. I was buying these items over and over, when, in reality, I still had plenty at home. You may be doing the same thing. I suggest taking inventory of what you have before making your shopping trips to cut back on duplicate items. This is also a good time to take a look at what you're eating more and less of. Take that feedback and adjust your shopping habits accordingly. Stop buying what you're not eating. I changed my diet to include primarily fresh, healthy foods so much, that I've whittled down my pantry from a large closet in the hall to just three cabinets in the kitchen. You've heard time and again that all that processed junk isn't good for you — and it isn't — so maybe now's a good time to clean the pantry. Keep the essentials, donate the excess, and start eating a little cleaner. If your pantry seems to be fattening instead of slimming, you need to use more of what you already have. An easy way to do that is to plan your meals. On Sunday, decide what you'll make for breakfast, lunch, and dinner for the week, and try to integrate some of your pantry items into that menu. Not only will you save time by having a plan of attack when you're hungry (which helps ward off last-minute take-out meals), but you'll reduce your stockpile of overflowing pantry items without spending any extra money. 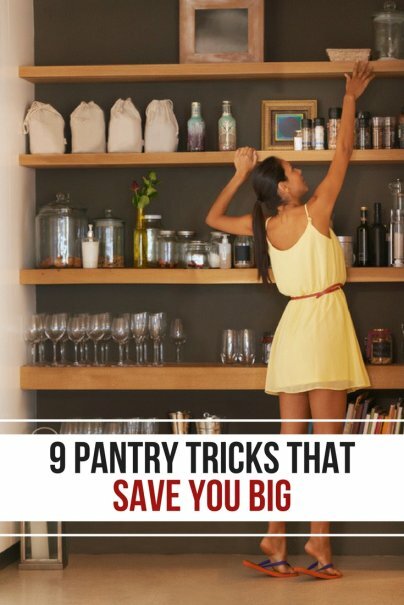 Do you have more pantry tricks that have saved you big? I'd love to hear your tips. Let me know in the comments below.